A Massa Marittima Restaurant with steak as soft as clouds! 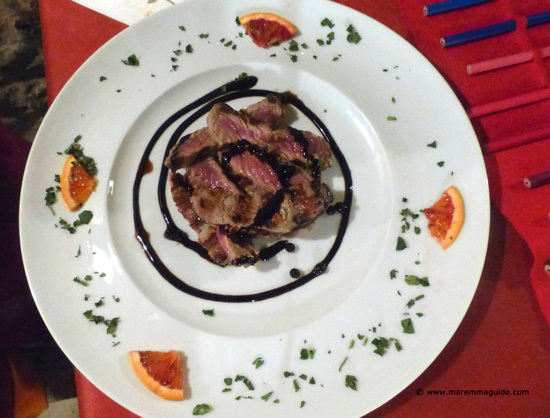 A Massa Marittima restaurant with steak "as soft as clouds". Well, those were the exact the words my young daughter used to describe how "morbido" (soft) her grilled "tagliata" steak was when, entirely unprompted, she was still talking the next day about how good her entire meal was the night before. Our Italian grandparents - "nonni" - have eaten with us there too and were just as content as our daughter. 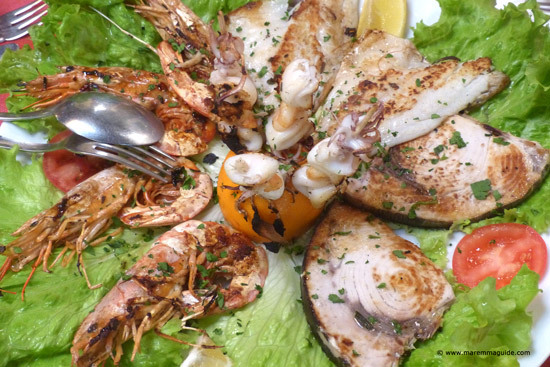 So, if you are looking for a great family restaurant in Massa Marittima then this is it: our favourite, the trattoria "Sbrana". But now I need to tell you that, although it is a Massa Marittima "ristorante" - it lies within the town's borders - it isn't in the town itself, but is located just a two minute drive (1.5 kilometres to the front door) north in the village of Ghirlanda. But those two minutes are well worth the trip and will leave you with smiles all around :) young and old. You will be hard pressed to eat in the town centre as wonderfully well and as reasonably priced as here. My daughter's antipasto, mixed crostini for one - "crostini misti". 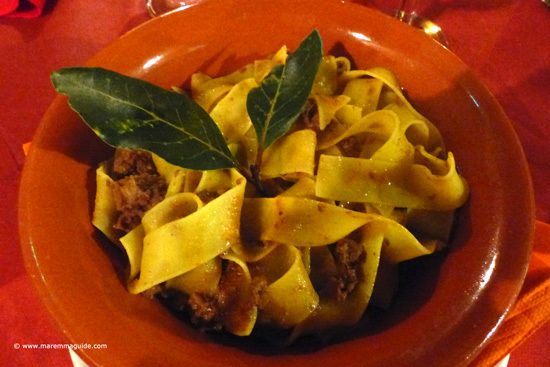 My pappardelle pasta with wild boar - "pappardelle al cinghiale". And the "tagliatelle ai funghi" - tagliatelle pasta with porcini mushrooms. Now if when you go to order wild boar stew, Fabio, the owner, by chance invites to try instead the roasted leg of wild boar with baby onions "cipolline", say yes! I was all set on the "il cinghiale in umido", and my husband on the sliced steak, but roasted wild boar is a rare option on menus, and so we conceded to Fabio's suggestion. Our plates arrived and the meal looked so good that I didn't remember to take a picture until I was half way through! It tasted great too! The "Tagliata" sliced steak with balsamic vinegar in this photograph is for our daughter and is a child's portion just for her. The normal portions are much bigger - some couples choose to share one - and come wonderfully presented in a tower. 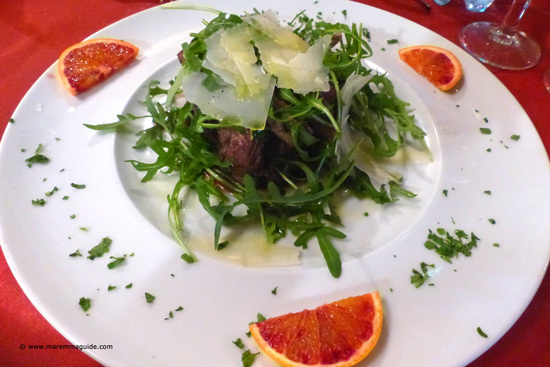 This is the "Tagliata con Rucola e Parmigiano" - full portion - with rucola and slices of parmigiano cheese. The menu also includes the "Tagliata" with porcini mushrooms, olive oil and rosemary, "tartufu" (truffle), or seasonal vegetables. 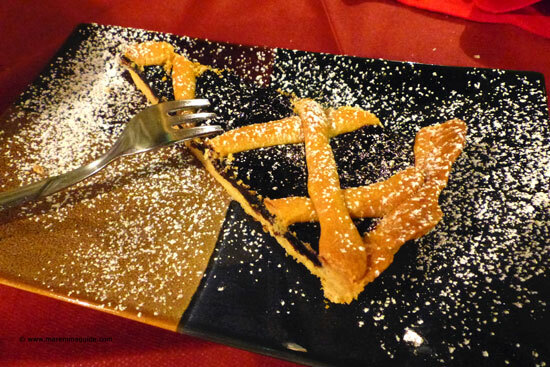 The dolce" - desserts - are homemade and vary from day to day. The "crostata di marmallata" - that's jam tart where I grew-up in the UK! at Sbrana is wonderful. And I have eaten a lot in Tuscany - it is a traditional pudding in restaurants and is sold in bread shops, bars and supermarkets - as any good researcher must do ;) to be able to tell you that. The pastry is light and crumbly and the jam covering really generous and justly sweet. This one is with "mirtilli" - blueberry - jam. But they also make it with albicocche - apricot - jam. 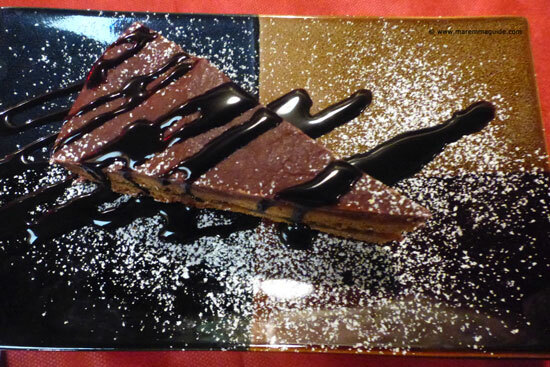 Another one that went down really well with the "nonni and zia" - grandmother and aunt - was the handmade sachertorte. I know the photo isn't that good, but I had to take this one rather quicker than the others as there were eager eyes and forks waiting! Now none of us thought that neither would finish theirs, but they did - down to every last morsel - and you should have seen the smiles on their faces afterwards! Two very happy Italian women!! Trattoria Sbrana is open at lunchtimes too, but not always for their pizzas. Which I have to tell you are the best in the whole Massa Marittima area. More often than not, they are our Friday night take away treat and, although we don't live in Ghirlanda and have to make a special 30 minute round-trip to collect them, we do so willingly even though we two restaurants that serve pizza in our own village! Popular with locals is the "Trattoria Sbrana" pizza, with a base of tomato sauce, topped with mozzarella, porcini mushrooms, and wild boar sausage. Or, the "Maremmana", with mozarella, cherry tomatoes, porcini mushrooms and "lardo di colonnata" (thin slices of prized lard). Note, this is a pizza "bianca" - it doesn't have a covering of tomato sauce on its base. And they do a "Trippa" too - tripe pizza. One of my favourites is the "Gonzaga", which is also a pizza bianca, with a base of "crema di zucca" - pumpkin/squash puree, topped with mozzarella, sausage, and slices of parmesan cheese. Service, wines, prices and making sure you get a table! The service here is excellent: it's a family affair. You'll never be rushed, you won't have anyone looking after your shoulder watching you eat, but you will be looked after attentively. Even on a really busy day, they are professionally organised and take a full restaurant easily in their stride. Children are welcomed with open arms, and readily catered for. Mum's, you probably won't even have to ask for a smaller portion if you were thinking of doing so, as Fabio and his family will probably ask you anyway. If you aren't sure which wine to order, take it from me that the house red is great and sufficiently rounded and robust to accompany the steak. 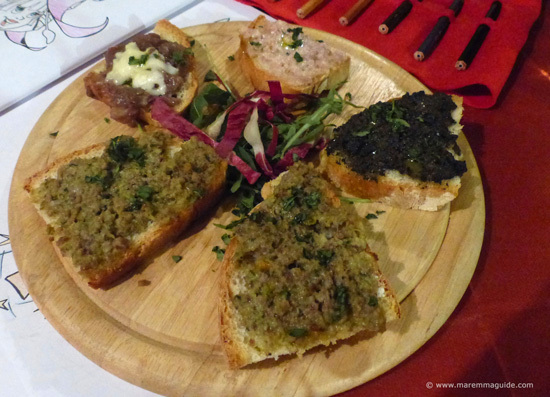 Prices wise, the antipasti start at €4,00 - the crostini misti are €5,00 - and go up to €20,00 for a plate of mixed fish for two. 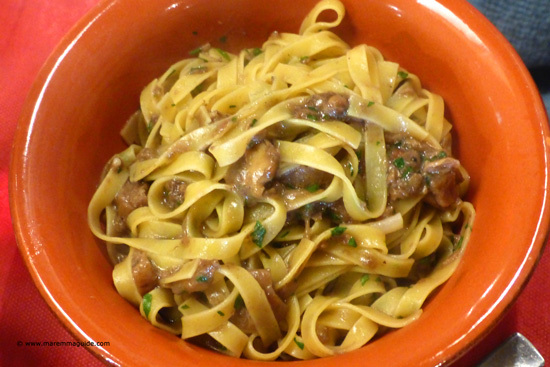 The primi piatti start at €7,00 - the Pappardelle al Cinghiale is €8,00 - and go up to €10,00. 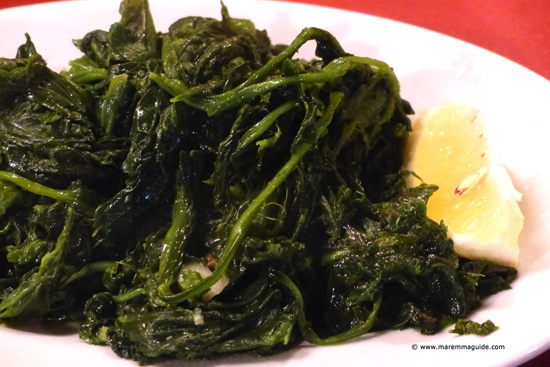 The secondi piatti start at €5,50 - the Tagliata Rucola e Parmigiano is €13,00. Ghirlanda is a small village with nothing in it to see at the junction of two main roads through the hills north of Massa Marittima. Not so very long ago it used to be a centre of limonite and pyrite mining and a key point in the transport of iron-ore to Germany, with its own major train station marking the northern-most junction of the Massa Marittima-Follonica mining line. But Trattoria Sbrana is always busy and full. So book ahead if you want to be sure of a table. Now if you are eating here for the first time and haven't yet visited Massa Marittima, then there is nothing more for me to say than you must! Other places nearby for a walk to work off that lunch in the afternoon or dinner the next day are the freshwater Lago dell'Acessa and its Etruscan tombs in the woods around. Or, for a bit of an adventure, the ruins of the Castel di Pietra. These three are, without a doubt, the best places to stay in Massa Marittima.